I made this cake for my husband's 30th birthday. He loves fishing and the outdoors. The cake is a chocolate fudge cake with homemade buttercream and cream cheese icing. For the fish, I used white fondant to mold his shape with the gumpaste kit tools. I mixed luster dust with Almond extract and then hand painted the fish to show the colors. I then brushed the pearl dust over the top to make it shine and give it that oily fish appearance. 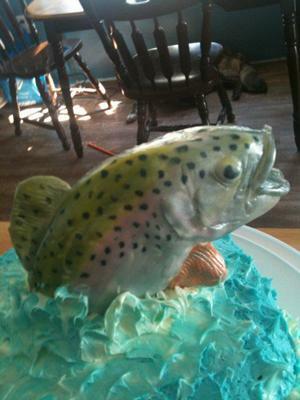 The fish was placed on dowels and then inserted in the cake. I used the spatula to make the waves on the and around the fish to give the appearance of coming out of the water. The cake was loved and I was pleased with how it turned out. looks so real, great job.